Public Advocate Joins 100s To Protest Anti-Family Anti-Liberty Policies in Richmond, Va. Today | Public Advocate of the U.S.
Public Advocate joined with hundreds of conservative Virginians today, Monday, January 18, 2016, to protest the radical and illegal actions of VA Attorney General Mark Herring. Public Advocate's protest signs were proudly waved throughout the crowd, while hundreds wore our "Support Traditional Marriage" badges. AG Mark Herring betrayed Virginia voters when he went to court against our 2006 Marriage Amendment -- using his position to push his own personal agenda. He has also refused to act to defend Virginia school children from the dangerous "transgender bathroom agenda" being push in our state by the Homosexual Lobby. 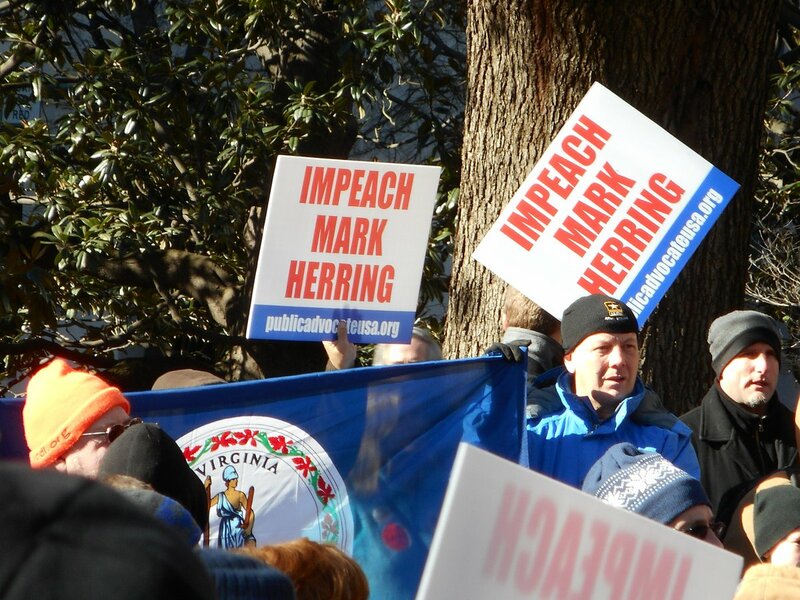 Public Advocate's signs read "Impeach Mark Herring" -- expressing in spirit the deep frustration and opposition so many Virginians feel towards our attorney general. "Many, many in the crowd expressed their sincere wish that there did exist a mechanism to impeach Mark Herring as AG. Public Advocate made headlines almost exactly two years ago when we led the very first protest of the new administration -- calling out the anti-family agenda of Herring and then governor-elect Terry McAuliffe at their inauguration. And we are confident that Attorney General Mark Herring will once again hear our message and feel the level of opposition his agenda is facing in Virginia."